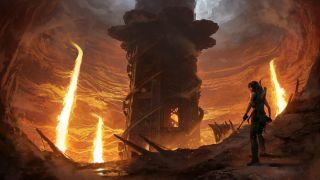 The Forge is the first of seven DLC packs coming down the pipe for Shadow of the Tomb Raider. The Forge adds a challenge tomb playable solo and co-op. Completing the DLC will unlock a 'grenadier' skill, an outfit and the Umbrage 3-80 weapon. According to Square Enix Lara "must brave the lava-flooded Forge of the fallen gods to uncover the secrets of Kuwaq Yaku." "Throughout her journey, Lara will uncover details about a friend’s ancient legacy, and overcome a danger long thought to be lost in flame." Hopefully it's the Tomb Raider 1 T-Rex, back for revenge. The Forge is due out on November 13, and it will cost $4.99. To be honest we will mainly use this as an excuse to take more awkward vacation photos using Tomb Raider's photo mode. Here are some screenshots to set the scene.